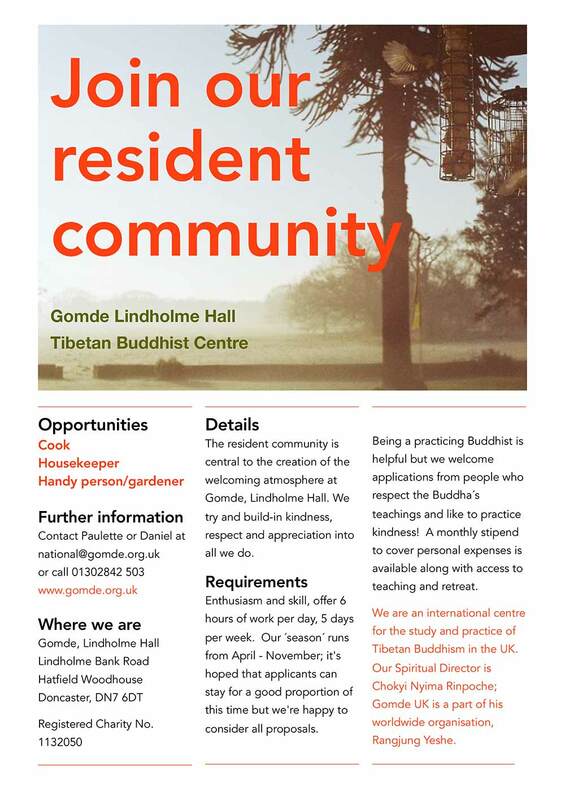 Chokyi Nyima Rinpoche, has a substantial centre in England between York and Lincoln; Gomde, Lindholme Hall. 2017 is set to be a busy year at Gomde as we plan to offer more teaching and practice opportunities. We also have planning permission for a substantial development at the centre and in 2017 we will start with the refurbishment of the coach house which will provide a warm and comfortable base for year round teachings and retreat. This is an exciting new phase. We are looking for volunteers to join the resident community from March 2017 to be part of this significant development which will expand our activities on many levels and provide a strong base for the Dharma in England. If you are interested in working for the dharma, in a secluded and supportive setting, with opportunities for retreat, teaching and practice -this may be for you! Opportunities Available: Cook, Housekeeper, Gardener /handyman. If you would like further information or full details in respect of any of our vacancies please visit www.gomde.org.uk or contact Paulette or Daniel at national@gomde.org.uk or call 01302 842503 for a chat.